Children see the world differently; they are closer to the ground and have a different perspective on the room and their mess. Take yourself down to their level and you may be surprised at how different it looks. Adult items may look good in their rooms but they may be difficult for your child to use; replace them with furniture, shelves and cupboard which their hands can manage. If you get your child or children to help you organize their room you will gain an understanding of why they struggle to keep it tidy. You will then be able to address this issue and help them develop a good attitude towards organization and tidiness. Make it as easy as possible for your child to keep their room tidy; remove unwanted or outgrown items and provide easy to use storage boxes. Everything has a place and children will quickly learn to store things in the right place; they will be able to find it when they need it! Plastic tubs are great for storing toys, but they must be the right size! If they have a lot of tiny parts they need to store all the parts for one item in a small container; this can then be placed safely inside the large container. This will also help you to show them the importance of tidying away when they have finished. Before they can get a new toy out all the pieces of the old toy must be put back into the relevant container. The easier it is for your children to put their belongings away the more likely they are to put them away; in general you should make it as easy as possible to put things away whilst making it difficult to get them out in the first place! For example, books can be stored in an upright file, allowing your child to select any book and then just drop them back in afterwards; in any slot. You do not need to worry about all the books falling over when getting them off the book case. Children tend to be shorter so it is essential to put the most used items on the bottom shelves with the least used on the top shelves where they may be difficult to reach by themselves. It doesn’t matter if you use drawers, shelves or cabinets, stick to this routine and your child will not need to keep disturbing you to get a prized toy. They will also be able to return them to where they belong. This is a good way to teach your child to be organized and to help them put things away. Label every box of toys they have, use labels and writing that is big enough for them to understand, alternatively pictures may help. This will ensure your child knows where each item belongs; it will also make it easy to change tidying up time into a final game of the day; match the object. It can be very difficult for a child to know when and what is expected from them if the boundaries keep changing. Instead of having random tidy days and clear outs create a schedule. Your child will know when they need to tidy the room and what you expect; this will make it much easier for them to do! There’s no need to invest thousands of dollars to keep your kids happy and pleased with the way their room looks like. Sometimes all it takes is a little ingenuity to make things work. Consider fun, playful bespoke furniture designs, colorful pillows and cushions, and drawers. This way their room will be easier to clean and they’ll even learn how to stay organized. Buy a magnetic board—like this one and hang it on a bedroom wall. Potty training my older daughter Rosie was such an intimidating task and one I had been dreading and avoiding. The horror stories I had heard from others coupled with the arrival of my younger daughter so close to the time Rosie began showing readiness signs made me nervous. So much so that I began putting the process off. Now, in hindsight, I have no idea what I was so worried about. I firmly believe that if a child is truly ready, they can be potty trained in just 3 days! The most well known 3 day method is Fellom's Three Day Method. However, after researching several methods and then going through the process, this is how we successfully potty trained in only three days. A child's readiness is the fundamental key to their success. Each child is ready to train in their own time, with the window of readiness being roughly between 18-36 months of age. So, how do you know if your child is ready? There are several lists of readiness signs like the ones here and here. However, after going through the process there are only a few readiness signs I feel are truly necessary before beginning to potty train. Language- Your child has to have the language needed to express that they need to use the bathroom. This really only needs to be one word. When Rosie was first potty trained, she referred to both pee and poo as pee pee. When she needed to go to the bathroom, she would run over and say pee pee. That was all the language needed to convey that she needed to go. Crystal from Fussy Monkey Business had a vintage end table that was sitting in her attic for 2 years which was purchased at a local garage sale for just $5 dollars. She didn't know quite what to do with it, because it looked dated. It was when she was playing with her children, that the idea came to mind that the piece could be used as a lego table. 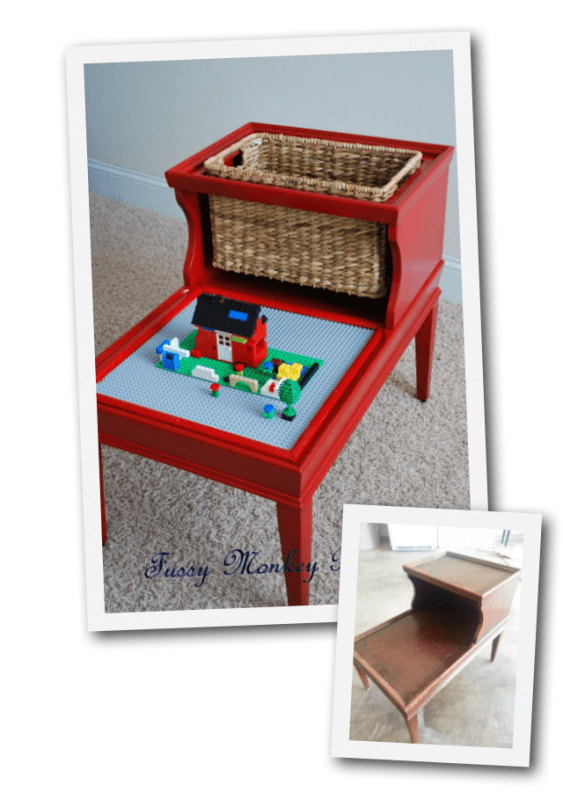 She used a jig saw for the top, and used a lego plate that she bought from a local store to create this one of a kind piece. 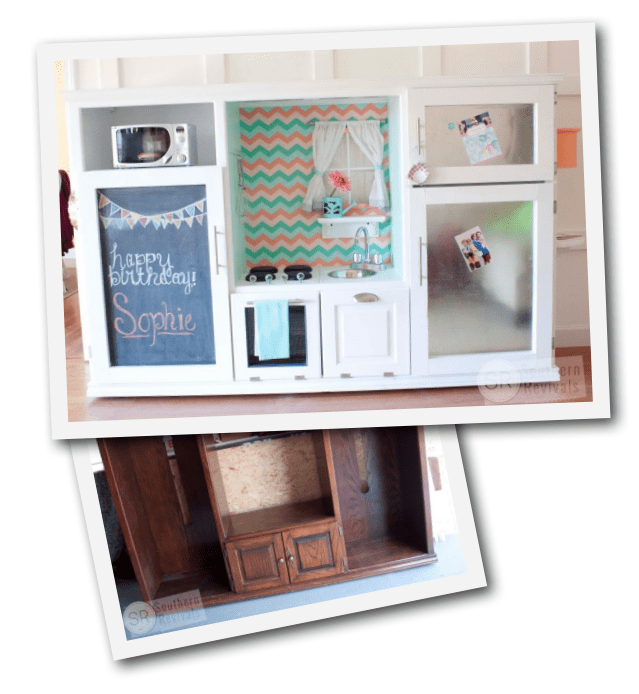 Jamie from Southern Revivals thought outside the box when she decided to turn a used entertainment center into a play kitchen for her niece’s 3rd birthday. The entertainment center was given a new coat of white paint. Wallpaper was applied to the back of the cabinet wall, and new doors were added to make the cabinet doors. Round wooden plaques were used for the stove tops, and a little microwave was found online to complete the look. Everything from the mini curtains, to the insides of the cabinets was well thought out as well thought out for this beautiful little creation. Do you want to get organized this next year? Take your cues from this mom who put together a command center where the kids could drop off their homework, the families calendar was within reach, and the important phone numbers and info could be found. As you can see, she simply created a box on the rectangular wall using tape, which she then painted with chalkboard paint. Use clip boards, mount an erasable calendar in a frame, and utilize some wooden desk organizers which could be painted and drilled into place. What do you think? Do you need one of these for your own home? Expecting moms have a lot of time on their hands to experiment with modern nursery decorating trends, vibrant colors and trending accessories until they come up with the most appealing room look. Still, even with the constantly evolving interior design market, there is something inimitably charming about classic decors, which is one of the main reasons so many moms-to-be prefer the traditional feel to short-lived nursery fads. If you want to create an ambiance of comfort and everlasting elegance in the nursery but have no idea where to start, we have several simple tips here to help you out. To create a perfect backdrop for a stylish nursery, paint the walls in neutral colors. White, beige, cream and light yellow will work for both baby girls and boys, and they also let you add a wide range of secondary colors as accents should you feel like experimenting once the baby arrives. An all-white décor has a universal appeal, but if the look feels too dull for your taste, you can paint the ceiling white and opt for creamy wall paint tones for tasteful nuance. Though a nursery filled with sunlight looks like an image taken out of old-fashioned magazines, you will still need proper shades to make sure your little ones sleeps through the night. Babies tend to wake up at the slightest ray of light, so installing custom blinds and shades in the nursery may be a wise idea. You can opt for blackout shades, Roman or Venetian blinds or long drapes made from rich, heavy fabrics – just make sure the window dressing tone coordinates well with the overall color scheme in the room. When it comes to classic nursery furniture, wood is definitely the most appealing and longest lasting solution. On top of adding a note of sophistication to the room, furnishings made from solid wood will not give in easily to the outbursts of tough love a growing baby may put them through. When shopping for baby bedding, cot-beds are probably the most affordable option as they will allow your growing offspring to get a good night’s sleep in many years to come, up until time comes to move the kid into an adult bed. Adaptable furniture is another clever idea that will provide high flexibility of use without compromising the classic nursery design. Instead of investing in a full-scale changing station, get a wooden chest of drawers that will both accommodate baby clothes or linens and double as a changing area when topped by a soft mat. Shelving with a removable changing section will work well too, and since they will easily adapt to the needs of a growing child, such two-in-one designs will definitely prove the best value for money in the long run. To round off the ambiance of classic elegance in the nursery, adorn the walls with large mirrors in elaborately executed frames. In addition to their antique appeal, oversized mirrors will also visually expand the room, which can be a precious asset if the nursery is not generous size-wise. Other old-fashioned accessories you can throw in to achieve an everlasting chic look include a collection of porcelain dollies, antique chandeliers, knitted cushion covers, needlepoint designs and handcrafted storage boxes. Classic nursery décor is relatively easy to achieve: pastel tones, solid wood pieces, soft fabrics and quaint accessories will certainly prove the most rewarding backdrop for the life of a growing baby. Plus, a room look that does not lose charm as the child grows is always a better – and more affordable – option than a snazzy décor that calls for extensive upgrades every time nursery fashion trends change, is it not? 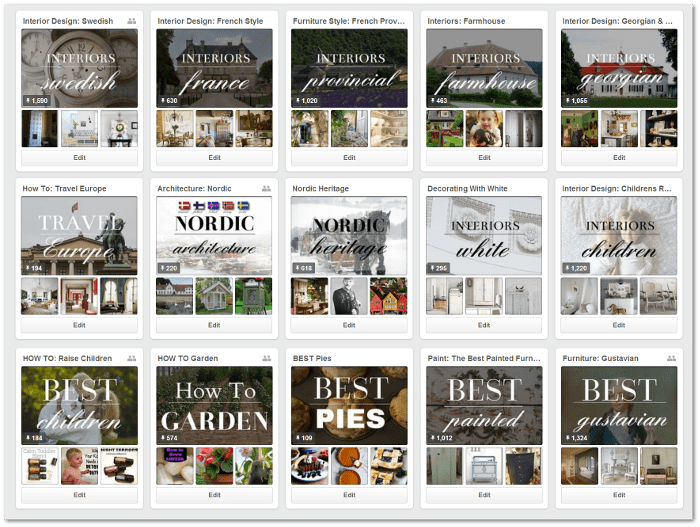 About The Author: Zoe Clark is a mom of one baby girl, DIY and home design enthusiast. Since decor is her passion, she is always trying to use it for learning and playing with her daughter. You can find her on Twitter.